Pay attention to the important safety notes . Do not rotate the head restraints of the front and rear seats. Otherwise, you cannot adjust the height and angle of the head restraints to the correct position. ■ To raise: pull the head restraint up to the desired position. ■ To lower: press release catch 1 in the direction of the arrow and push the head restraint down to the desired position. With this function you can adjust the distance between the head restraint and the back of the seat occupant's head. pull the head restraint forwards in the direction of the arrow until it engages. : press and hold release button 1 and push the head restraint backwards. ■ When the head restraint is in the desired position, release the button and make sure that the head restraint is engaged in position. Adjust the head restraint so that the back of your head is as close to the head restraint as possible. ■ To adjust the head restraint height: slide the switch for head restraint adjustment up or down in the direction of the arrow. ■ To adjust the side bolsters of the head restraint: push or pull right and/or lefthand side bolster 1 into the desired position. 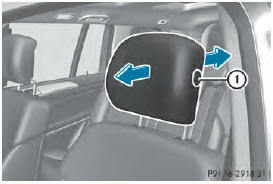 ■ To adjust the fore/aft position of the head restraint: push or pull the head restraint in the direction of arrow 2. 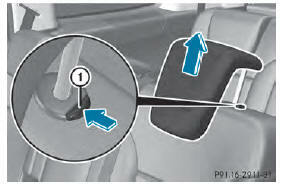 ■ Once the head restraint is fully lowered, press release catch 1. 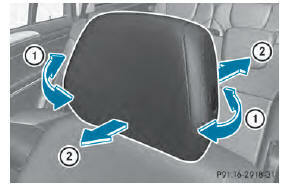 ■ To lower: press release catch 1 and push the head restraint down until it is in the desired position. ■ To remove: pull the head restraint up to the stop. 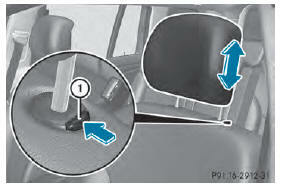 ■ Press release catch 1 and pull the head restraint out of the guides. ■ To re-install: insert the head restraint so that the notches on the bar are on the left when viewed in the direction of travel. ■ Push the head restraint down until you hear it engage in position.